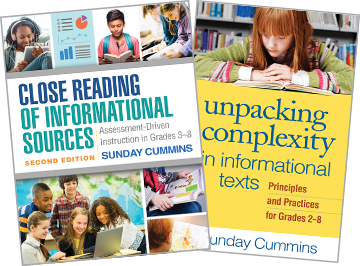 Sunday Cummins, PhD, is a literacy consultant and author of professional books on assessment-driven instruction with informational sources. Formerly, she was Assistant Professor in the Reading and Language Department at National Louis University, before which she worked in public schools for 10 years as a middle school and third-grade teacher and as a literacy coach. Dr. Cummins teaches and learns alongside educators and students as a consultant and researcher with a focus on the power of informational sources to transform students’ thinking. She shares her experiences by presenting at state and national conferences, writing articles for numerous publications, and blogging regularly. Her website is www.sunday-cummins.com.